Russian war planes pounded Syrian rebels unaffiliated with Islamic State of Iraq and Syria (ISIS) on Sunday, insurgents said, helping Moscow’s ally Bashar al-Assad reclaim territory and dealing a fresh setback to the strategy of Washington and its allies. The Syrian Observatory for Human Rights, a group that monitors the 4-year-old conflict, said the Syrian military and its Lebanese Hezbollah militia allies had taken control of Tal Skik, a highland area in Idlib province, after fierce Russian bombing. That brings Syrian government forces closer to insurgent-held positions along the main highway that links Syria’s principal cities. The area is held by a rebel alliance that excludes ISIS fighters. “The coming battles are going to be ferocious, the Russians are using scorched earth policy and they are hitting the targets very accurately but this is a battle of destiny,” said Abu Hamed, the head of the military bureau of Jabhat Sham, an insurgent group that operates mainly in Hama province. “We are fighting for our very existence and so this is why our fighters are exhibiting heroism and fighting for our beliefs against the Russian occupiers,” he said. 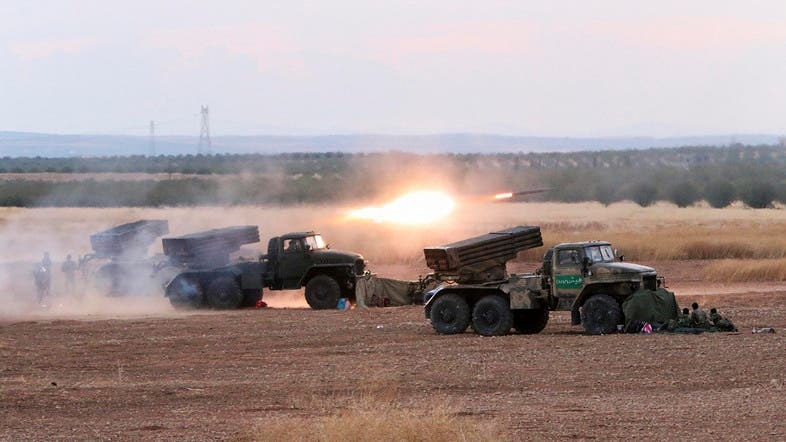 The Syrian army had made advances from the towns of Mourek and Atshan in Hama province using tanks, heavy artillery and new surface-to-surface missiles, he said. Russia’s Defence Ministry said on Sunday its planes had flown 64 sorties, striking 63 targets and destroying 53 fortified positions in the last 24 hours. As in the past, it described all targets as belonging to ISIS, although most of the areas it said it struck are not held by that group. Syrian state television also reported the capture of Tal Skik after an “extensive military operation” backed by Russian air strikes against “terrorist organisations” in the area. 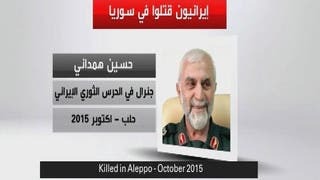 However, the advance came at a cost, with the Observatory and a Lebanese television station reporting that a senior Hezbollah commander was killed in the battle while fighting on the Syrian government’s behalf. In recent days, Russia has dramatically intensified its 10-day-old bombing campaign. Moscow says it is targeting ISIS, but most of its strikes have hit other rebel factions fighting against Assad, some of which have the support of Arab powers, Turkey or the United States. The Russian bombing has been accompanied by a major advance led by Syrian government forces, backed by thousands of Lebanese Hezbollah militiamen and hundreds of Iranian troops, shifting the balance of power in the civil war. Russia’s intervention has infuriated Assad’s regional foes, including most Arab countries and Turkey. In his biggest effort yet to reach out to Assad’s Arab foes, Russian President Vladimir Putin met Abu Dhabi’s Crown Prince Mohammed bin Zayed Al Nahyan, who holds a senior post in the armed forces of the United Arab Emirates. At the meeting on the sidelines of a Formula One motor race in Russia’s Sochi resort, Putin said he welcomed the opportunity to discuss security in the region, particularly in the light of bombings on Saturday that killed up to 128 people in Turkey. In a television interview quoted by Interfax news agency, Putin said he did not want to take sides in a religious conflict in Syria. Assad is a member of the Alawite minority sect derived from Shi’ite Islam, and his regional allies are Shi’ites, while Sunni Muslim states oppose him and back mainly Sunni rebels. Turkey, a NATO member which has accused Russian aircraft of violating its air space during the bombing campaign, said Syrian jets and missile systems had harassed its fighters at the border on Saturday in the latest incident. Moscow said its officials had held a second video conference with counterparts from the United States to ensure that flights would be safe. The former Cold War foes are both flying combat missions in the same air space for the first time since World War Two. 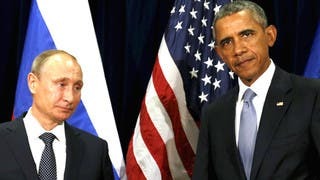 The Russian intervention has upended the strategy of the U.S. administration of President Barack Obama, which has led a separate bombing campaign against ISIS for a year but failed to establish strong ties with fighters on the ground. Washington and Moscow say they have the same enemy in ISIS, the world’s most violent jihadist group, which has set up a caliphate in much of eastern Syria and northern Iraq. But they have very different friends. Washington and its European and Middle Eastern allies oppose the Syrian president and believe he should leave power in any peace deal, while Moscow supports Assad and says his government should be the centrepiece of international efforts to fight extremism. Washington has announced in recent days that it is abandoning a failed effort to train “moderate” rebel groups opposed to both Assad and ISIS. Other rebels fighting against Assad are equipped and trained by Washington’s Arab allies and range from secular nationalists to Islamist militants affiliated with al Qaeda. Moscow accuses Washington of effectively siding with other militants that are no different from ISIS; Washington says the Russian campaign helps ISIS by targeting its rivals. In recent days, ISIS fighters have taken advantage of the Russian attacks on rival rebel groups to advance near Aleppo in the north of Syria, the Observatory and sources on the ground say. The Observatory said there was fighting on Sunday between ISIS and other rebels in that area, although no change in positions since Saturday.